An FDA-approved, non-invasive, once a week 25 min. treatment for spot reduction, cellulite, loose skin and wrinkles on the face, neck and body. It uses radio frequency, thermal heat, and magnetic pulses to shrink fat cells and stimulate the generation of new collagen and elastin fibers (10 CONSECUTIVE sessions minimum). 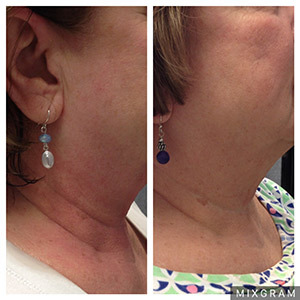 Venus Freeze softens lines and wrinkles on face and neck. It also firms fat pockets, reduces volume, contours and tightens arms, flanks, abdominals, buttocks, and thighs for a 40-80% improvement. Seven minutes on the whole body vibration platform gently rids the body of stubborn fat by jump starting your lymphatic system. When your body is at an ideal weight, it can function as it was designed and improve your physical, mental, and emotional health. Your complete health is important to us. That’s why we offer a range of holistic health care options to help you reach your maximum level of wellness. “I have completed 10 Venus Freeze Sessions on my thighs. The procedure has helped tremendously with cellulite and dimpled skin. My thighs are thinner with more definition, as shown in my before and after pictures! I started to see noticeable results by the 3rd and 4th treatment! It took patience with combined effort of healthy food choices and a consistent exercise routine. 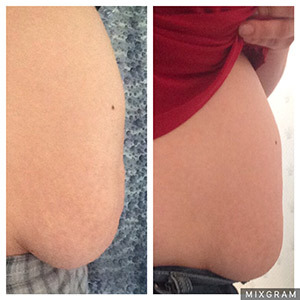 Before & After 10 Venus Sessions on stomach and a 21 day Detox/Cleanse. Patient lost 4″ on waistline and a total of 14 lbs. As part of the Mercedes Benz official fashion week circuit, the city of Madrid was a must-stop for us on the #VenusBeauty media tour. February 11th marked the start of Madrid Fashion Week, and the Venus Concept team was positioned in the heart of the action – backstage with a bevy of models, editors, and media. Spain has a rich cultural history, with global fashion megastars like Manolo Blahnik, and a distinct style. Over 30 designers showed collections, with models flying in from all over the world to walk the prestigious catwalk. A model’s life involves late nights and early mornings during fashion week, and the ladies of the catwalk were more than happy to catch some downtime in our model hangout area. Amanda and Steffi, two Spanish models both based in New York, caught up with us while they enjoyed Venus Legacy treatments at our backstage treatment bar. Browsing through the latest fashion glossies they proudly showed off their cover stories and features of the week. Continuing our global conversation around the definition of beauty, we asked the models about their beauty concerns. For some, it was maintaining that coveted model thigh gap, while others wanted to preserve their face, without turning to drastic measures. As the cropped trend shows no sign of slowing down, many chose a Legacy tummy treatment to show off ultra flat stomachs with nothing but confidence. It wasn’t just the ladies who enjoyed the immediate plumping and glowing effect. Many male models treated their face and neck to be ready for cover shoots, and the men of GQ and Cosmopolitan España dropped by to try a Legacy treatment firsthand. Since a model’s look is their calling card, investing in maintaining and enhancing their natural beauty in a non-invasive, non-surgical way is a top priority. From Paris, to New York, to Madrid and London, fashion weeks can take a major toll on fatiguing skin, and there is zero time to slow down. The combination of multi-polar radio frequency and Pulsed Magnetic fields utilized in Venus Legacy treatments, cause a thermal reaction in skin tissue, stimulating the body’s natural healing process. After much excitement, it was adios to Madrid, and time to gear up for our next European stop. Continue following #VenusBeauty for our global beauty conversation.